Nay Pyi Taw, Nov 10: Myanmar’s Union Election Commission on Tuesday announced 106 parliament representatives-elect, including 54 to the lower house – House of Representatives. Democratic leader Aung San Suu Kyi’s National League for Democracy (NLD) dominates the the House of Representatives with her party securing 49 of the 54 seats, reported Xinhua news agency. The ruling Union Solidarity and Development Party (USDP) took three seats, while the Wa Democratic Party and Kachin State Democracy Party have one each. 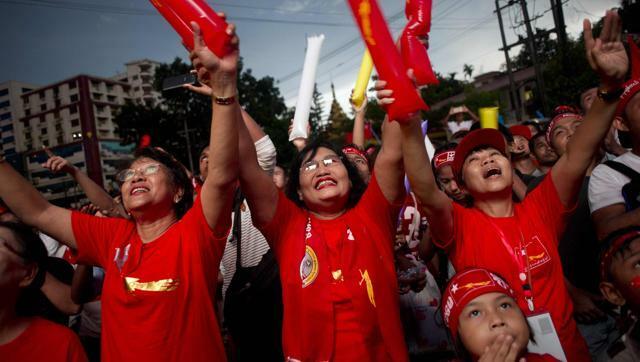 A total of 6,038 candidates from 91 political parties and 310 independent runners contested on more than 1,000 seats at three levels of parliament in Myanmar’s election held on Sunday. So far, the NLD has secured a total of 96 parliamentary seats in two levels of parliament, according to the first-day election result. The remaining series of the results will be announced on a daily basis by the commission, said UEC Chairman U Tin Aye. The 106 people announced on Tuesday will become parliament representatives in Yangon, Bago, Mandalay and Ayeyawaddy regions and the Shan state. Of the total, 1,733 candidates are running for seats of the House of Representatives, 886 for the House of Nationalities (upper house), and 3,419 for Region or State Parliament. The general election excluded seven townships in Shan state and 454 village-tracts in other states for security reason.